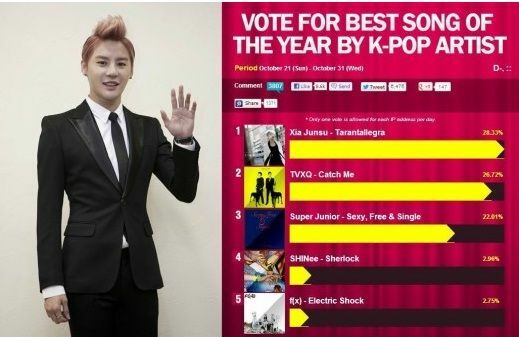 “Tarantallegra” of JYJ’s Jun Su has recently been selected as the best K-pop song of 2012. K-pop news site K-pop Starz did a survey about the best K-pop song of 2012 from October 21 to 31. As a result, “Tarantallegra” received 28.33 percent of all votes and ranked first. “Tarantallegra” is a song written by Jun Su. Jun Su’s strong look, the song’s distinctive choreography, and the unconventional music video of the song attracted a lot of attention. “Tarantallegra” has also topped the charts all over the world. It ranked first on the iTunes Chart in Japan, the Tower Records Chart, the Asian Music Chart in Germany, and ETC-TV Pop Chart in Chile and tenth on the Billboard World Albums Chart. As we previously reported before, “Protect The Boss” was exported to Ukraine Link. JYJ Park Yoo Chun fans have come out, once more, in full force to show their love for the star. 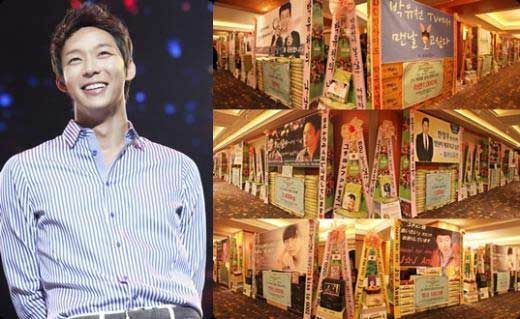 According to Park Yoo Chun’s C-Jes Entertainment fan clubs from 26 different nations came together to send congratulatory rice wreaths for the star at the press conference for his upcoming MBC drama, I Miss You with some 12 tons of rice donated in all for charity. In addition, 2,160 charcoal briquette packs, 2,000 packs of instant ramen and 100 mango trees were also donated by fans as well. C-Jes Entertainment thanked fans once more for their overwhelming love and support and ensured all the donations would go towards helping those in need. Park Yoo Chun’s I Miss You premieres on November 7. And Yoo Seungho who came back as a man! Let’s meet the main characters of the topic drama “Missing You”! [The heart-trembling first love is coming! MC: We met the main characters of the new Wed-Thurs drama “Missing You”! Hello! YC: I am Park Yuchun who plays the role of Han Jungwoo in the Wed-Thurs drama “Missing You”. Nice to meet you. Caption on the top left: not only good looks, but even acting skills~! Return of the original acting-dols! Do you wish a sad emotional melodrama that will dig deep into your heart? Then keep an eye on this drama, this fall. YC: I will make the viewers cry so that they can spend a warm winter.